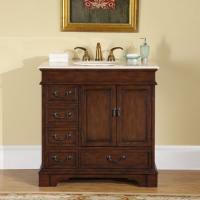 This traditional style single sink bathroom vanity base has an updated sleek look that will be a wonderful addition to the home. 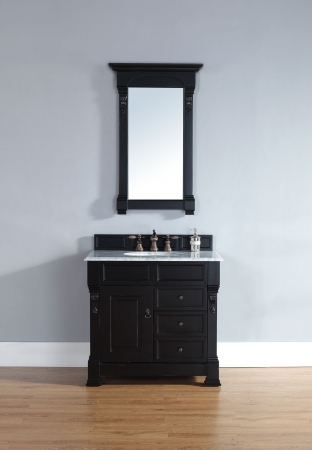 The dark finish will go great with any color scheme and will enhance most types of room dÈcor. The antique finish of the hardware pulls and visible hinges are a great touch for this deep shade. The cabinet is designed for great functionality aside from being the base for the sink and countertop. 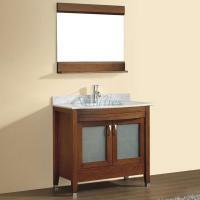 The single door and two drawers offer roomy space for storage and organizing which is very helpful in any bathroom. Within the cabinet area is a shelf for even nice organization options. There is a wide range of options available for the counter top to this piece. Any one of the choices will go well with the black finish and the inventory to choose from changes on a daily basis. This type of purchase arrangement allows for being able to make the best choices to get the perfect piece for the bathroom.